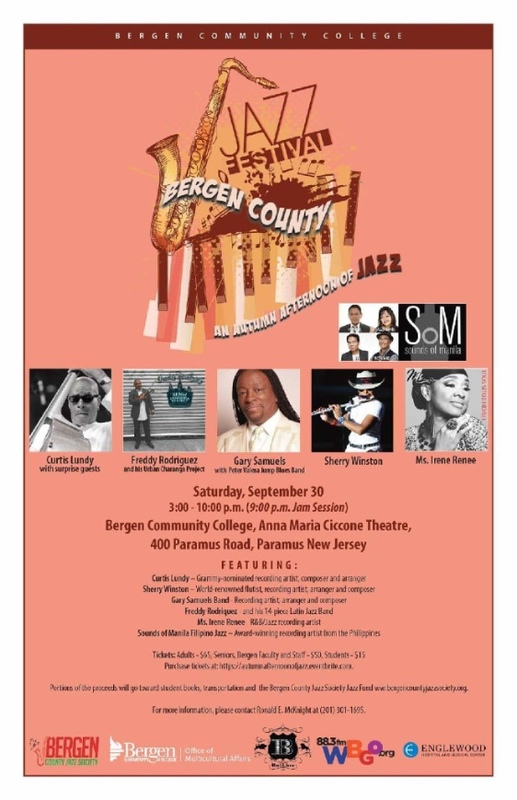 The talent lineup for the Bergen County Society Jazz Festival includes Grammy-nominated recording artist/bassist/arranger/composer Curtis Lundy (Sundance Award winner); Flutist extraordinaire/recording artist Sherry Winston; Gary Samuels with Peter Valera Jump Blues Band; Freddy Rodriquez and his 14-piece Latin Jazz band, R&B/Jazz recording artist Ms. Irene Renee; Award-winning recording artists Sounds of Manila Filipino Jazz Band and introducing Bergen Community College alum Annette Genovese (Aband) with special guest pianist Jim West. Portions of proceeds will go toward student books, transportation for Bergen Community College students and the Bergen County Jazz Society mentoring program: www.bergencountyjazzsociety.org. Event sponsors: Englewood Hospital and Medical Center, WBGO 88.3 FM, Vision Credit Federal Union, The BulLion Foundation and Bergen Community College Office of Multicultural Affairs. The Bergen County Jazz Society was formed by Grammy-Award Nominee and International Jazz Bassist Curtis Lundy and Ronald E. McKnight. The vision is to celebrate jazz artists in Bergen County and Internationally. The goal is to share the beauty and the richness of jazz with the audience and in the classroom with students. We will assist in providing for jazz musician in need. Housing. Homelessness, Food, Clothing and Medical. Mission: Bergen Community College’s Office of Multicultural Affairs (OMA) fosters diversity and intercultural awareness among the college community. The Office of Multicultural Affairs is in line with the mission of the college, “to educate a diverse student population in a supportive and challenging academic environment that fosters civility and respect.” We promote cultural and diversity issues within and beyond the college community. OMA provides a forum for diversity education and training, social and cultural awareness, and self- exploration and discovery. We will provide the tools necessary for students and the community-at-large to empower themselves.